This is my friend K's recipe. 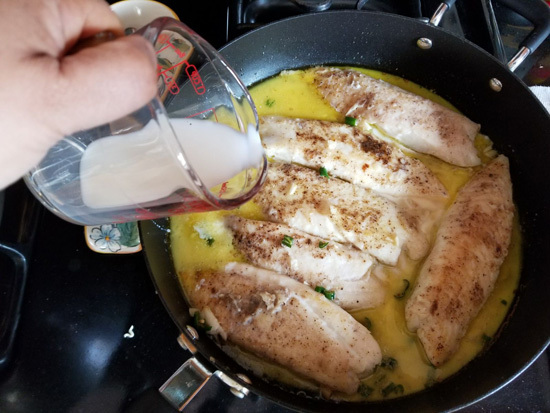 I am not sure if he would like his whole name here so we will just leave it at K. This is a Tilapia with loads of garlic and bit of milk which he thinks he learned from a Italian Cooking show. When I saw the original video however I realized that this dish is more his creation than any Italian grandmother's. The addition of milk gives the dish a texture like my Mother's Dudh Maach, which the kids love, and then the garlic and green chilies take it to another level. This dish can be served just by itself with some bread or with rice. We love it with rice like everything else. Both K and I, have come a long way when it comes to honing culinary skills. There was a time 20 years back, when I had a reputation for frying cauliflowers by throwing them at the kadhai from a distance. Ahem, a considerable distance. Given that I was non-athletic and had hardly every netted a basket, the cauliflower throwing was a hit and miss affair. That I ever managed to make a "aloo-phulkopi" with cauliflowers in it, seems like a complex probability problem to me now. K, has his own stories from the similar time period. 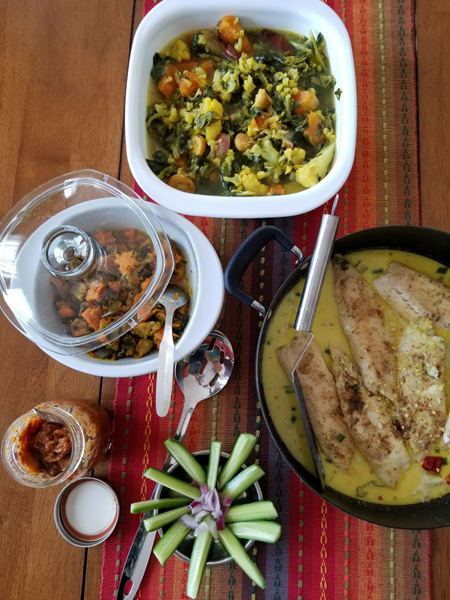 His culinary experiments ranged from pressure cooking rice in milk to make "dooddh-bhaat" and making a dal-gosht that even the stray dog in their neighborhood refused to touch. None of that deterred him though and that is a good thing. As you can well imagine, our friends still make fun of our amazing skills. But believe me, all that is a thing of the past. I have come a long way from those disasters. And same with K. Actually he is far a more adventurous cook than me and tries his hands at new technique and recipes all the time. He goes well beyond his comfort zone and every time we visit, there is a new dish waiting for us. I pick up the ones, that my girls oooh and aah over. I know those are the ones I can pass off on weeknight dinners. I also make sure that I pick only the simple ones to try at home. This Fish dish with loads of garlic, a touch of lime and then milk was what he made on our last visit. It was a simple dish, taking 30 mins max from start to finish. The perfectly done fish in a pale daffodil gravy was as pretty to look at as it was to eat. You could have it with some bread or white rice. My girls loved it so much that I had to make it once we were back and since then it has become a fixed dish on the menu every week (until they tire of it). 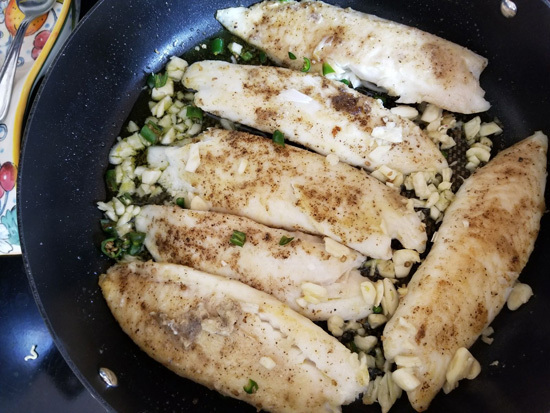 Buy Tilapia Fillet. If You have got the bigger ones, I would suggest to cut it into two. 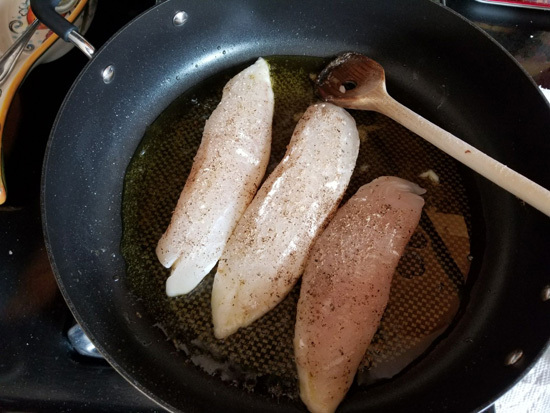 I got the Tilapia Loins and they were slimmer than the filet. Get a whole head of garlic, about say 12 pods. Either use a garlic press to press them or mince all that garlic. Garlic plays a important role in this dish so don't skimp. We are going to make this Bengali hot, so grab a bunch(4-5) of green chili and chop them fine. If this scares you just use 2. 1. Rinse and pat dry the fillet. Dust the filet with flour. 3. Heat a large skillet over medium-high heat. 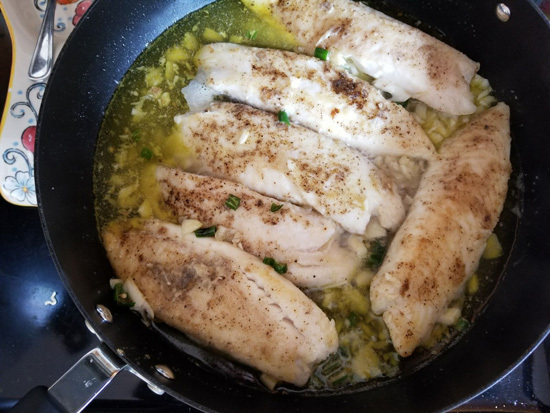 Warm 2 tablespoon of olive oil and then add the tilapia fillets. Cook 3 minutes on each side or until pale golden and cooked through. 4. Stir in the minced or pressed garlic and the green chilies. I needed add little more Olive Oil. Move the garlic-chili around so that they cook in oil and become soft. 5. Add 1/2 Cup of water at this point. You are supposed to add white wine or broth, but we all just make do with water and it tastes fine. 6. Next goes in 1 tsp of lime juice, zest of a lemon and salt to taste. If you have added wine just check if you need the lime juice. 7. When the water bubbles and reduces to half, add 3/4 Cup of Milk. 8. Let it simmer for a few minutes. Add some parsley or dhonepata (I had neither). 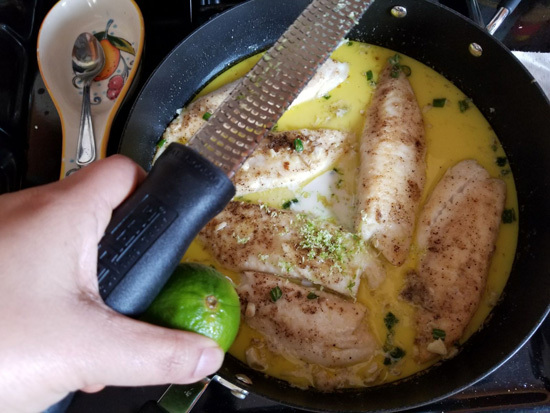 Taste for seasoning and adjust salt, pepper and lime juice to taste. Serve with the sauce but we love it as a jhol with rice. Good stuff! This is my recipe for lemon chicken sans the green chillis! Can be taken with pasta in that case. I love your Dudh Maach recipe. This looks good. Which other fishes will taste good in thissauce?